Half of U.S. adults today are married, a share that has remained relatively stable in recent years but is down 9 percentage points over the past quarter century and dramatically different from the peak of 72% in 1960, according to newly released census data. The decline in the share of married adults can be explained in part by the fact that Americans are marrying later in life these days. In 2016, the median age for a first marriage was 27.4 for women and 29.5 for men – roughly seven years more than the median ages in 1960 (20.3 for women and 22.8 for men). But delayed marriage may not explain all of the drop-off. The share of Americans who have never married has been rising steadily in recent decades. At the same time, more adults are living with a partner instead of marrying and raising children outside of marriage. Marriage rates are also more closely linked to socio-economic status than ever before, according to a Pew Research Center analysis of Census Bureau data that shows that the education gap in marital status has continued to widen. In 2015, among adults ages 25 and older, 65% with a four-year college degree were married, compared with 55% of those with some college education and 50% among those with no education beyond high school. Twenty-five years earlier, the marriage rate was above 60% for each of these groups. Marriage rates continue to vary widely by race and ethnicity. In 2015, 54% of white adults ages 18 and older were married. This is lower than the share of Asians who were married (61%) but significantly higher than the share of Hispanics (46%) or blacks (30%). The gap between whites and blacks has remained fairly consistent over time. Among adults who have never been married, 58% say they would like to get married someday and 27% are not sure if they want to get married. Still, 14% say they do not want to get married, according to a Pew Research Center survey conducted in August among 4,971 U.S. adults. Never-married adults who have not completed college are more likely than college graduates to say they don’t plan on marrying in the future. Among those ages 25 and older, 20% of never-married adults without a bachelor’s degree say they do not want to get married, compared with 11% among four-year college graduates. Adults ages 50 and older who have never been married are about three times as likely to say they don’t want to get married as never-married adults younger than 50 (32% versus 11%). 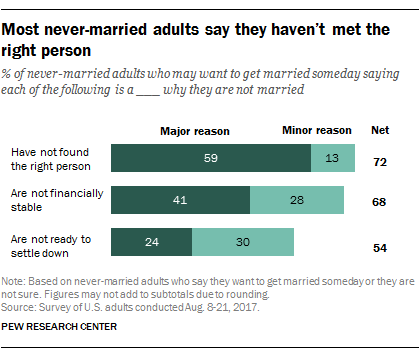 Overall, similar shares of never-married men and women say they do not want to get married someday. For unmarried adults who have previously been married, tying the knot again holds less appeal. Only about a quarter (23%) of unmarried adults who have previously been married say they would like to marry again, 45% say they don’t want to get married again and an additional 30% say they aren’t sure. Among adults who have never been married but say they are open to marrying in the future, about six-in-ten (59%) say that a major reason they are not married is that they haven’t found the right person. An additional 13% say this is a minor reason they are not married today. Majorities across a range of demographic groups cite this as a major reason why they are not married. About four-in-ten never-married adults (41%) who say they may want to marry in the future say that not being financially stable is a major reason they are not currently married, and 28% point to this as a minor reason. Fewer – but still a substantial share – say that a major (24%) or minor (30%) reason they are not married is that they aren’t ready to settle down. Never-married adults with family incomes under $75,000 are more likely than those with higher incomes to say that not being financially secure is a major reason they are not married: 47% of those with incomes less than $30,000 and 40% of those with incomes of $30,000 to $74,999 say this is the case, compared with 21% of those with incomes of $75,000 or higher. 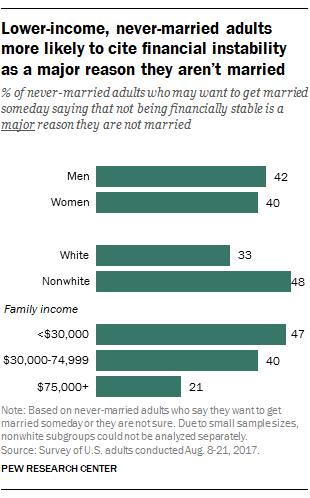 Nonwhite adults who have never been married are also more likely than whites to say a major reason they aren’t married is that they are not financially stable (48% vs. 33%). For young adults who have never been married, not being financially stable and not being ready to settle down loom large as reasons why they are not married. Roughly half of never-married adults ages 18 to 29 (51%) say not being financially stable is a major reason they are not married, compared with 27% of those ages 30 to 49 and 29% of those 50 and older. Young adults are also more likely than their older counterparts to cite not being ready to settle down as a major reason why they aren’t currently married: 31% of never-married adults ages 18 to 29 say this, compared with 14% of those ages 30 to 49 and 18% of those 50 and older. There are no major differences by age group when it comes to not having found the right person – similar shares of young, middle-aged and older adults who have never married say this is a major reason why.